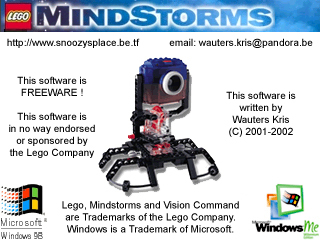 Back in the year 2000, I was selected as a preview member by the Lego company, for the release of the Vision Command. (I was already a mindstorms forum host at that time, and received gifts from Lego from time to time) Worldwide they selected 5 preview members. So, I decided to write my own ActiveX component, so I could use the Vision Command camera, from within my own VB applications. Back then, I had a website called ‘snoozysplace’. (My nickname was Snoozy in those days) After about a year and half, I had about 12800 registered users of my Vision Command ActiveX. Note that the URL and emailaddress in screenshots and documentation about this component, are no longer valid !